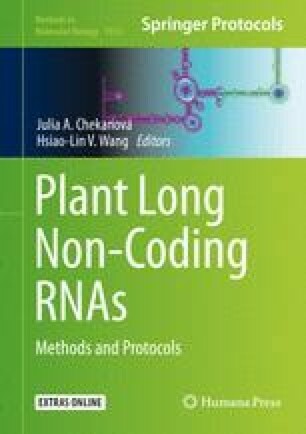 Long intergenic noncoding RNAs (lincRNAs), which possess diverse features such as remodeling chromatin and genome architecture, RNA stabilization, and genome architecture, are important regulatory factors in plant genomes. They serve to fine-tune the expression of neighboring genes. Here, we describe a procedure of discovery, identification, and functional characterization of plant lincRNAs after virus infection. From high-throughput RNA-Seq transcriptome analysis, the noncoding RNA transcripts with significant fold changes (upregulation or downregulation) will be discovered and identified. The lincRNA of interest will be further confirmed and validated using rapid amplification of cDNA ends (RACE). In addition, functional characterization of the lincRNA will be followed up through overexpression and knockdown strategies. This work was supported by the Ministry of Education Tier 1 research grant R-154-000-A34-114 through the National University of Singapore (NUS) and NUS High School of Mathematics and Science.